I’m going to change tacks a bit here, leave topology behind for a second, and talk about sets from a less naive, more higher math perspective. An axiom, by the way, is an assumed truth or defining property. Most people are at least a little bit familiar with Euclid’s axioms for geometry; without actually saying what points or lines or planes are, they define (more or less) the essential relationships between them, and the true statements of geometry are all logical consequences of the axioms. Points, lines, and planes are supposed to be atomic, not relying on any previous definitions, so that their meanings are entirely given by the axioms, and not our preconceived notions of what they “look like.” In the immortal words of David Hilbert, we must always be able to replace the words “point,” “line,” “plane” by “table,” “chair,” “beer mug” and still have valid proofs. Well, the Zermelo-Fraenkel axioms (or ZFC; the C stands for “choice,” the last axiom) do essentially the same thing for set theory, with the ideas “set” and “element” taken as atomic. So we can think of “sets” as being a kind of thing and “is an element of” as being a kind of “relation” between two sets, but other than that we shouldn’t be using the standard “collection-of-things” visualization that sets were first introduced with. Rather, the axioms will formally give us the idea that “piles-of-things” model so well. We’re also going to go forward without “things” to pile: all sets will be sets of other sets, and we only know that a set exists if we can build it from the axioms. Below the jump, I introduce the axioms. They’re usually given as sentences of formal logic, using mathematical symbols, but I’d rather say them in plain English. I’ve added a page listing the topics I plan to cover. As always, I welcome suggestions. The “long-term” section should be interpreted as being pretty long term. It’s essentially the horizon that I’m constantly running towards. There will of course be diversions along the way that don’t have anything to do with those goals: for instance, I’d like to talk about analysis and differential geometry at some point, too. Today I’m going to talk about two more or less unrelated ideas: a partial order on the set of topologies over a space, and topologies that “come automatically” with a totally ordered set. Hopefully my post will be a good deal shorter than last time. What we’re going to do today is a degree more abstract that what we’ve seen before. Unlike sets, which everybody really thinks of as piles, functions, which everybody thinks of as algorithms, and equivalence relations, which we proved you could think of as partitions, topologies don’t have an easy built-in metaphor. Higher math commonly defines these abstract lumps that end up having nice properties, but when you learn about them, it’s difficult to get past the fact that under the properties, they’re only abstract lumps. I’d say topological spaces are the first abstract lump most students encounter — yet by being abstract, they create a foundation for dozens of more specific fields. There is a metaphor you can use to understand them, though as we’ll see, you don’t always want to use it, and either way it takes some thinking about. 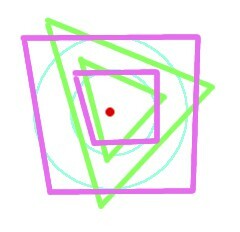 All three shapes give the same idea of closeness. The metaphor underlying topology is closeness. Take three points in — that is, standard Euclidean 3-space, with -, -, and – axes and all the rest. How do you decide which of the second and third points is closest to the first? Clearly, you just measure their distances. What if I just asked you to tell me which points in space were close to the first one? You’d probably say something in terms of distance as well: “the points inside this ball are all within 0.001 units of distance from our point, so they’re pretty damn close.” Maybe you would decide to formalize it, calling the points inside a sphere of radius “ -close” to the center, and noting that every -close point is also -close for , so that we can choose which of two points is closer by seeing which one satisfies more closeness conditions. “But this is just the same as finding distances!” Sure it is. But check this out — we don’t need to use spheres. We can instead -closeness to mean “contained in a cube of side length centered around our point.” Or we could use irregular tetrahedrons. Now the distance function and closeness sets are utterly separated, but if one point is closer than another in any of these definitions, it is closer in all of them! How does the ant know what kind of surface it's on? The basic idea of topology is that we can define this kind of “closeness” without even needing to measure distance at all. Believe it or not, problems with distance-measuring can crop up in even the most familiar of spaces — our own. Though distances are easy to measure in “flat” Euclidean space, our space is actually curved by mass and other relativistic forces. So finding the distance between two points theoretically requires us to find a shortest path between them. But we can study the curvature of space and find its “shape”, using topology, without having to measure distance at all. If this is difficult to visualize in 3 dimensions, imagine an ant on a surface. If the surface is large enough, the ant can’t really see what it looks like — but we’ll show how the tools of topology can allow him to figure it out from the inside. 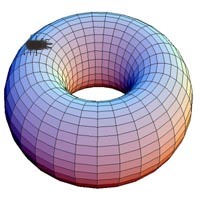 I really wanted to say something about topology last night — maybe tonight. I had a take-home midterm last night that I just barely got done. This time around, picked up a physics textbook, a book on computability, and this crazy little thing called SIMSOC. Created by the sociologist William Gamson, it looks to be a social experiment/role playing game/business retreat exercise focused around the challenges of maintaining a coherent society while trying to satisfy your individual goals. A relation from to is just a subset of . For example, is a relation from to that includes, say, , and so on. We generally write instead of $(a,b)\in R$. Except in very few circumstances, we actually only care about three kinds of relations. This will probably be review for a lot of readers, but I just want to make sure we’re all on the same page before we really start. These terms get used a lot a lot in higher math. In the 1900’s, sets were seen by luminaries like Bertrand Russell as being the salvation of math, since you could describe basically any mathematical structure in terms of sets. Nowadays, mathematicians tend to believe that the “guts” of math really aren’t that important, and category theory, which instead describes the relations between structures, has become more foundational. By the way, category theory is just about the coolest possible thing, but its coolness only really becomes apparent once you have a bedrock of examples to work with. I’ll start talking about it much later. For now, let’s talk about sets.